Concrete Driveway Services in Waukesha County WI. Due to its durability and versatility, concrete is a great material option for driveway replacements and installations. Cement can support reasonably heavy loads and is easy to maintain. Additionally, a well-designed driveway can significantly enhance the curb appeal of any property. We replace and install driveways all throughout the Waukesha and Washington counties. Our professional contractors are passionate about designing custom driveways that meet every client need. For new driveway installations, we make sure that all vegetation and grass is removed from the home construction site. Additionally, we ensure that the soil foundation is properly stabilized and that elevations are adjusted so that proper drainage is maintained. For driveway repairs, we apply a polymer-based cement resurface or polyurethane sealant where appropriate. We are also happy to provide follow-up services in cases where issues have developed in the concrete that we poured. Do not hesitate to reach back out and let us know if something does not seem right. YOU are our number one priority. How Thick Do You Install Concrete Driveways? The cement layer for driveways needs to be at least four inches thick. Every additional inch increases the driveway’s load bearing capacity by almost 50%, but also adds 20% to the total material cost of a project. In addition to designing driveways and pouring cement, we also install sub-grades beneath the concrete to ensure that the right slope exists for water to drain appropriately. In general, we tend to install driveways with a quarter to half-inch grade so that water drains appropriately away from properties. With Pewaukee Concrete Contractors, you can rest assured that your driveway will be properly designed, graded, and installed. How Wide Do You Install Concrete Driveways? We are more than happy to work with you to design a concrete driveway that will fit the needs of your household or business. You’ll want your driveway to be wider than any vehicles that it will support. It’s also important to remember that you will want enough room to be able to maneuver around your vehicle when getting in and out of the car. We recommend that driveways are at least ten feet wide. We can help you explore the possibility of installing a wider driveway, however, we would need to ensure that your property lines and easements would allow this. Give us a call to speak with one of our professionals who can help explain everything you need to know about widening concrete driveways. Will My Concrete Driveway Crack? Concrete driveways that are installed properly will have controlled joints, or seams, that are put in while cement is still wet. As concrete dries, it tends to crack at these points. However, this is the only cracking that you should expect with a qualified and experienced concrete contractor. Cracking can occur when heavy vehicles beyond the load-bearing capacity of the driveway are left on the concrete for too long. 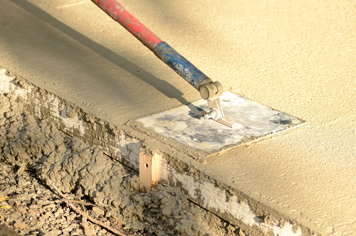 Improper grading or mixing can also lead to cracks in concrete driveways. With Pewaukee Concrete Contractor, homeowners and property managers have an experienced partner that knows everything related to driveway installations and replacements. If you need our help repairing the work of another contractor, do not hesitate to call our office and schedule a time for us to seal your driveway to prevent additional cracking. Contact our team today to get a free estimate for your driveway project and take the first step towards booking a dependable concrete contractor that you can always trust.